I was asked by my cousin if I could make her daughter a birthday cake for her party. 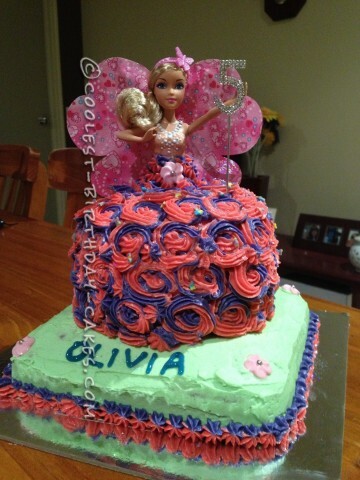 I was super excited and said yes as I made her other daughter’s 3rd birthday cake last year. I went with the classic Barbie Doll cake but a modern take on it. I was so excited to make it as I always from a little girl wanted to make one. I googled and YouTube various designs and steps into making them. Finally I decided to go with something to make it my own. I went with a square base (choc), cut it in half, spread choc ganache on one half then sweeten whip cream. Then I made a classic butter cream frosting and used green food coloring to make it a light green to cover the base. I put store bought edible flowers on each corner of the base. For the Barbie dress I baked another choc cake in a pudding tin, cut it in half and spread with choc ganache and whip sweeten cream like the base. I then dirty iced it and proceeded with the piping. To pipe I made to colors of icing, purple and pink. Spooned each color into two different disposable piping bags with the tips cut off. Then I put both bags of icing into another bag with a nozzle on it started piping. This creates the two tone effect. I tried the rose effect for the first time. 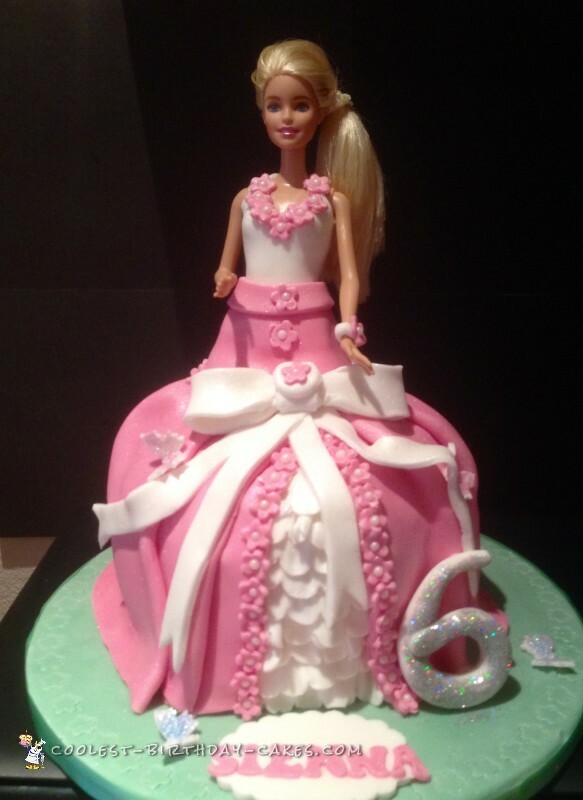 As I got to the top of the dress I stopped put my Barbie doll in and finished piping. The Barbie wasn’t a full size one she was a skipper size barbie. Finished off with some edible muti-colored butterfly sprinkles and some silver glitter dust. I found a diamanté “5” on a skewer at a local party shop and stuck that in the dress. Finished! I surprised myself with how well this turned out! I’m no pro but this looks pretty darn good. I’m pretty sure Olivia will love it! Birthday cake idea posted by Lisa T.